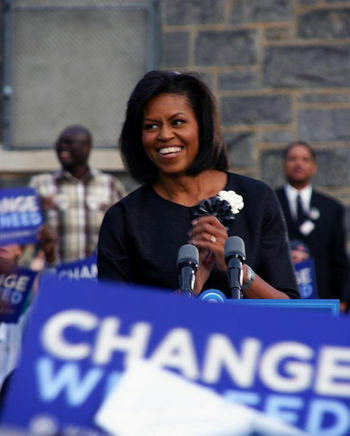 Michelle Obama campaigning in Philadelphia, September 2008. Michelle Obama (née Michelle LaVaughn Robinson, born January 17, 1964 in Chicago, Illinois) was the First Lady of the United States until 2017. She assumed the role on January 20th, 2009 when her husband, Barack Obama, entered office as 44th President of the United States of America and was the first African American to hold the title. Obama is a lawyer by profession. She graduated from Princeton University with a BA in 1985. In 1988, she earned a doctorate (JD) from Harvard Law School and later worked for a law firm and in the public sector. The Obamas have two children, Malia Ann (born 1998) and Natasha (born 2001; known as Sasha). Michelle Robinson grew up in a two-parent family in a working-class neighborhood on Chicago's South Side. She has one brother, Craig Robinson, the current head men's basketball coach at Oregon State University. She was salutatorian of her high school class, and then attended Princeton (BA, 1985), an experience which made her more keenly aware of herself as an educated African American. Her 1985 senior thesis was on "Princeton-Educated Blacks and the Black Community" and was dedicated to her family and "all my special friends". She stated that how black Princeton alumni viewed their place in society vis-a-vis the black community at large was of particular interest to her, as she was soon to join their ranks. Robinson felt that she had been made more aware of her blackness since attending Princeton, and was, to the Whites she encountered, "Black first and a student second." Sometimes misquoted or taken out of context, access to her thesis was restricted until after the presidential election. After graduation, she became an associate at a leading Chicago law form, Sidley and Austin, specializing in intellectual property. She became an aide to mayor Richard J. Daley, and then as the city of Chicago's assistant commissioner of planning and development. In 2002 she began working for the University of Chicago Medical Center; from 2005 she served as vice president of community and external affairs, responsible for all programs that involved the relationship between the Hospitals and the community; she also supervised the Hospitals' business diversity program. Obama cut back to part time employment citing family responsibilities and the demands of her husband's political campaign; she later took a leave of absence. 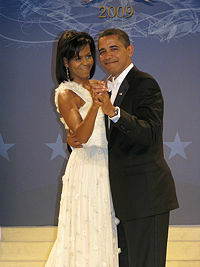 Michelle Obama with her husband at the Midwest Inaugural Ball in January 2009, following his swearing-in as President of the United States. As a career woman in her own right, Michelle Obama's elevation to First Lady reopened debate about the role of First Lady (or Gentleman) of the United States, and specifically whether it should be a paid position. Reaction to Obama in her role was generally positive, with Americans welcoming her position as an advocate for a healthy lifestyle, and her focus on eliminating poverty. African Americans, particularly, praise Obama as a positive role model, and she has received accolades from Essence Magazine and Oprah Winfrey. ↑ Widely reported in the press, that access to Michelle Obama's Princeton thesis had been restricted was confirmed by the myth-busting site snopes.com. ↑ Monica Langley,"Michelle Obama Solidifies Her Role in the Election", Wall Street Journal Feb. 11, 2008. This page was last modified 17:46, 20 January 2017.